.... although not many whould admit to that ! Love this cartoon - it is so true. I know that there's a lot to be said for feeling satisfied with a job well done, just for oneself... 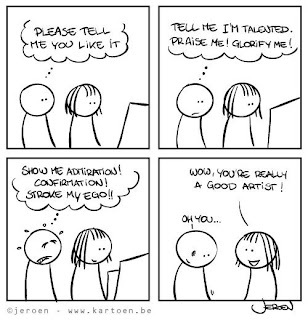 But who doesn't really want others to admire and praise one's work? Most artists are Normal Human Beings - who need praise and "positive strokes" just like everyone else! And the thing I love most about my work, is when the customer comes back and says "It's beautiful / lovely/ wonderful. It's just what I wanted. I love it!" Who wouldn't smile their face off at comments like that - and who wouldn't feel motivated to do more and better? And because they are customers and under no obligation to comment at all (by being related to/friends with the artist), it makes one feel sure they mean what they say. I am not ashamed to enjoy praise - it's wonderful! 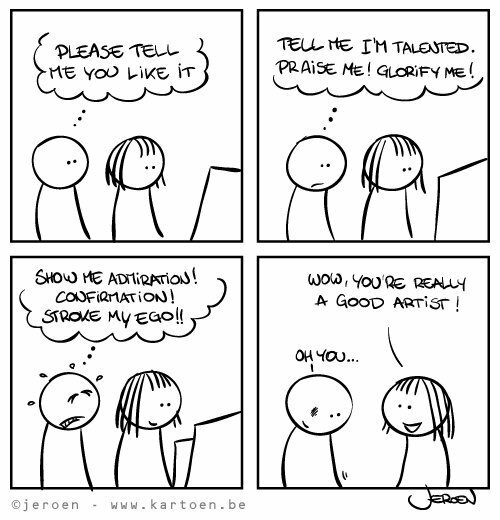 And, for the record, I also love to praise others, when I think their work is good. I like visiting here, because I often get that opportunity (lol)!